The Durango is the muscle car of midsize SUVs. In a class that usually offers turbocharged four bangers, this SUV offers a 293 hp V6 and a 360 hp V8. This midsize crossover features the unibody platform the Grand Cherokee is based on while offering better handling and performance. We think the Durango is one of the best-looking, most versatile SUVs you can buy. The Hemi equipped Durango offers an excellent alternative to the Tahoe or Yukon while retaining the agility we’ve come to expect from the midsize SUV class. If you want to tow, there aren't many alternatives without spending thirty thousand more on the V8 equipped BMW X5. The Durango offers comparable capability and luxury in a much more affordable package. 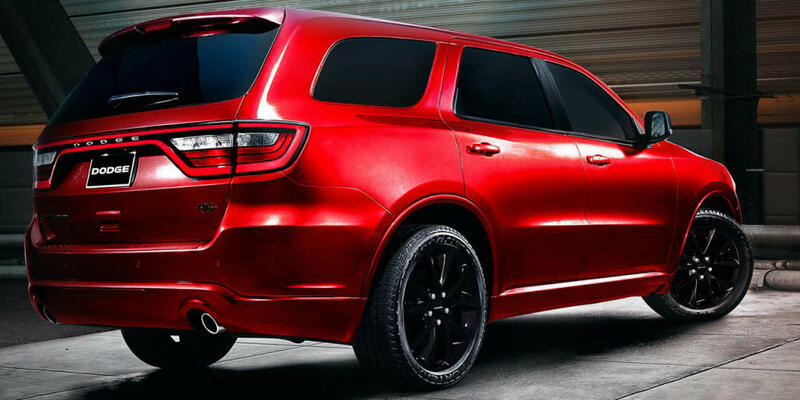 The Dodge Durango one of the most versatile midsize SUVs on the market. If you’re looking for an alternative to the larger truck-based SUVs like the Tahoe or Expedition, you should consider the Durango. It has an exceptional towing capacity for the class while retaining the driving dynamics of a much smaller SUV. The 3.6 Liter V6 can tow up to 6,200 lbs and the Hemi V8 can tow 7,400 lbs, the most in the midsize class. With a towing capacity this high, you would think the driving dynamics would be akin to the tuck-based Tahoe. But they aren’t, the Durango is surprisingly agile, especially with the R/T Hemi equipped trim that adds sport tuned suspension. If you’re looking for a 3-row SUV that can tow while retaining everyday driveability, the Durango is your best bet. The Durango sports a modern interior with soft-touch materials covering every inch of the dash. There are some hard plastic surfaces, but they are out of sight and below the knee line. The standard cloth seats aren’t bad, but the two leather-appointed options available on higher trims rival the quality of luxury competitors. There are several seating configurations. The standard is a 2nd-row bench that seats five. 2nd-row captain’s chairs are an option, as well as a 3rd row that seats two. The maximum seating configuration seats 7, but most upper trimmed Durangos will be configured to seat 6 with the 2nd-row captain’s chairs. The Uconnect infotainment system is one of the more intuitive systems on the market, with quick response and app-based operation. The standard system is 5 inches and offers aux compatibility, a USB port, and Bluetooth call capability. For Bluetooth audio streaming, you must upgrade to the 8 or 8.4in Uconnect infotainment system. Along with the upgrade, you receive a rearview camera, an upgraded Beats audio system, and satellite radio. There are a variety of optional advanced safety features, navigation, sunroof, and rear seat Blu-ray entertainment system attainable for an additional fee. 2nd and 3rd-row space is a little less than some of the top rated competitors like the Toyota Highlander or Honda Pilot but no worse than average for the class. Overall, the Durango provides an exceptional interior with family-friendly features and class-leading cargo capacity at up to 84.5 cubic feet. With a modern muscular appearance, the Durango boasts a refreshing design in a segment full of uninspiring exteriors. This midsize SUV is one of the few models this side of the luxury segment to offer standard LED running lights and taillights. The front fascia is reminiscent of the ever popular Dodge Charger and sports and aggressive lower intake that exudes muscle car prowess. The side profile is similar to the Grand Cherokee, with which it shares its platform, albeit a little longer. The rear is one of the more appealing derrieres in the segment with LED lights that stretch across the entire liftgate. Premium trims add dual exhaust outlets that provide better symmetry. We think this Dodge is one of the best-looking SUVs on the market. The Insurance Institute for Highway Safety awards their highest rating in all crash test categories except the small overlap front, which simulates a collision with a pole or tree. The National Highway Traffic Safety Administration provides a 4-star overall rating for the Durango. These ratings are average for the class and there are better choices if safety is a priority. Advanced safety features are only available on the highest trim levels, while competitors like the Toyota Highlander offer many of them standard. JD Power awards the Durango a predicted reliability rating of 3 out of 5, signifying reliability of the average SUV on the road. Consumer Reports disagrees with this ratings and offers a 1 out of 5 predicted reliability rating, though reliability has steadily improved since the 2011 redesign. The Durango has not had any NHTSA recalls since 2014, where it had eight. There were two issued for alternator failure, stability control failure, and a software error that allows third parties to control your vehicle, spooky. Additionally, models equipped with adaptive cruise control may accelerate unintentionally. All these issues can be resolved by your Dodge dealer for free. Be sure to check the VIN of a 2014 model to ensure these recalls have been resolved, as these issues are rather serious. 2014 models were also plagued with a variety of electronics issues, including display screen freezes, headlight problems, and gauge failure. It may be best to avoid 2014 models. 2015 models may have rough shifting transmissions and issues with the Uconnect infotainment system, especially models with navigation. Despite our research turning up many common complaints, it seems the Durango has far fewer Technical Service Bulletins issued by the NHTSA than average, with 0 for 2017 models, 22 for 2015 models, and just 50 for 2014 model. That’s still a low number for a model year with many troublesome issues. Outside of the 2014 and 2011 models, complaints of major issues are few and far between. We’d recommend the Durango as an SUV with average reliability, though we’d definitely avoid the 2014 model year. There are more reliable alternatives from Japanese competitors, like the Honda Pilot and Toyota Highlander. We think the Honda Pilot is one of the most attractive alternatives to the Dodge Durango. While it doesn’t have near the same towing capacity, a maximum of 5,000lbs, its advanced safety features, and better fuel economy make it a solid choice. There is slightly more second and third-row space in the pilot, though the overall cargo capacity is higher in the Durango. The standard infotainment system in the Honda boasts Apple Carplay and Android Auto, which isn't available in the Dodge. The driving experience is better in the Durango, though some may find the Pilot’s ride to be more comfortable. The Pilot also includes many advanced safety features standard, including a surround view camera that isn’t even available in the Durango. If you’re concerned with reliability, efficiency, and convenience, the Pilot may be a better fit for you. If you’re seeking a crossover with truck-like abilities and crossover performance, there is no substitute for the Dodge Durango. The base SXT model starts at 5 dollars shy of $30k and includes a 293 hp V6 paired with an 8-speed automatic transmission, keyless entry, LED lighting, projector fog lamps, intermittent wipers, 7in digital driver information display, and Uconnect infotainment system with SD, USB, and aux connectivity. A third row is available for an additional $695 dollars. The $32,195 dollar SXT Plus trim adds an 8-way adjustable driver seat with 4-way adjustable lumbar support, a roof rack, a leather-wrapped steering wheel, and availability of additional packages and options. The third row is also available, as are second-row folding captains chairs for $995, a towing package for $995, running boards for $995, and a chrome or anodized platinum appearance package for $995. A Popular Equipment Group for $1,250 equips heated front seats, heated steering wheel, rear park assist, rearview camera, an auto-dimming rearview mirror. A power sunroof is available for $1,195. The GT trim costs $37,495 and provides leather-trimmed seats, heated first and second rows, a larger 8.4in Uconnect system, a 9-speaker audio system with subwoofer, and a rearview camera. The second-row buckets and third row are also available on this trim along with the trailer package. The Blacktop Package costs $595 and adds black 20in rims, black badges, and black mirrors. The Brass Monkey Appearance Package adds 20in bronze wheels and gloss black badging. A Navigation and Power Liftgate Group equips its namesake, along with HD radio and a 5-year subscription to SiriusXM services for $1,495. The $2,395 Premium Group furnishes a 506-watt amplifier, Beats six speaker sound system, the aforementioned navigation and liftgate group, and a power sunroof. A $1,195 Safety and Convenience Group adds automatic high beams, HID headlamps, blind spot monitoring, cargo compartment cover with cargo net, and rain sensitive wipers. A second row console with armrest is available for $300. The Citadel trim arrives at $41,395 and is endowed with 20in wheels, bright dual exhaust tips, Nappa leather-trimmed seating, heated and cooled front seats, HID headlamps, power sunroof, and navigation. The 5.7 Liter Hemi is available on this trim for an extra $4k along with an upgraded rear axle. Many of the groups previously listed are available, along with a $2,295 Technology Group that equips adaptive cruise control, advanced brake assist, blind spot detection, forward automatic braking, and lane departure warning. A Premium Entertainment Group adds the Beats audio system and dual-screen rear Blu-ray entertainment system. The R/T model begins at $42,095 and furnishes the 5.7L Hemi, performance steering and suspension, Uconnect 8.4in with Navigation, heated and ventilated front seats, 20in wheels, HID headlamps with black bezels, and a heated steering wheel. The Blacktop Package, Brass Monkey Package, Technology Group, second row, and trailering packages are all available on this trim as well. Finally, the Citadel Anodized Platinum trim provides 20in wheels, soft touch hand-wrapped instrument panel with contrast stitching, Nappa leather, heated second-row captain's chairs, platinum interior and exterior accents, and HID headlamps. The Hemi is available as an upgrade. The Premium Entertainment, Technology, and Trailer Groups are available. All-Wheel-Drive is available on all trims for an additional $2,600 dollars.